Where is the church building, and when do you worship? Abiding Presence is conveniently located in Burke, Virginia at 6304 Lee Chapel Road near the intersection with Old Keene Mill Road. 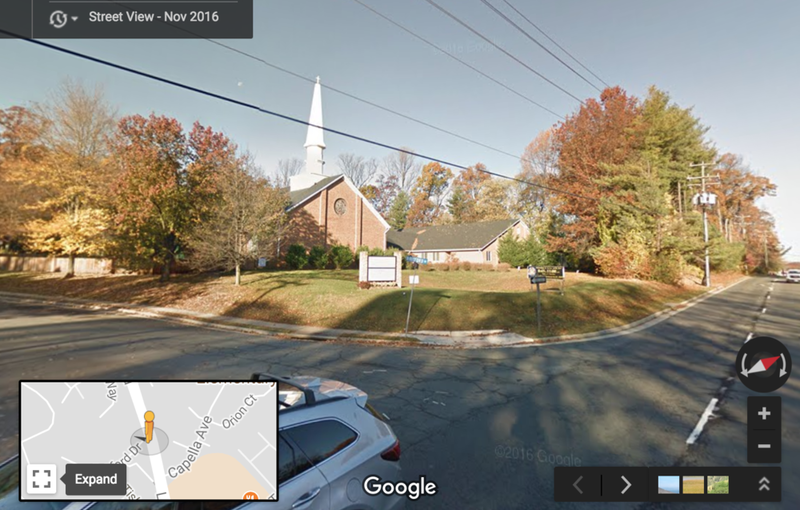 Interstate 95, the Fairfax County Parkway, and Route 123 all provide easy access to the church. Click here for directions. We have plenty of parking, including handicapped and visitor spaces. We worship on Saturday evenings at 6:00 p.m. and Sunday mornings at 8:45 a.m. and 11:00 a.m. (except in summer, when the late service moves to 10:15 a.m.), with Sunday school at 9:50 a.m. To check on special service times, head to the calendar page. We have three different worship services each week: a Saturday evening vespers service, a Sunday morning praise (contemporary) service, and a Sunday morning traditional service. All three include Bible readings, prayers, a children's sermon, a sermon, and Holy Communion. All are family-friendly, though the styles of worship differ. If you're not sure which service fits you best, feel free to just visit or talk to one of our Pastors. Visit our Worship Services page to learn more about each service. The short answer is, feel free to wear whatever makes you comfortable; we're just glad you're here! You will find people dressed in various ways at our worship services. The Saturday evening service is meant to be casual and people usually wear whatever they had on for the day’s other activities. The Sunday Praise Service is also casual and you will find people wearing everything from skirts to jeans and dress shoes to flip flops. You don't need to wear a suit and tie, but if you would like to you certainly can. The Sunday Traditional Service is our most dressy service, but you will still see people wearing a wide range of things. Some men may be in suits and ties while others will be in dress pants or jeans. Women wear everything from dresses to slacks to capris. We want you to wear whatever makes you comfortable and we can pretty much guarantee that you will find at least a few other people similarly dressed. Whatever you look like when you walk through the door, we’ll be glad you joined us! Do children stay with their families during worship? We love children in worship at Abiding Presence! Our goal is to equip parents, grandparents and other adults in a child’s life to model what it looks like to be followers of Jesus in the world today. We encourage children to participate in worship. We believe children “catch” the faith when they see their parents and other adults in the faith community living out their faith through worship. During the service, you can help your child follow along with what is happening in worship with the bulletin. We have suggested activities for during certain parts of the service to help children understand what is happening. Children will be invited to come forward for a children’s sermon. At the time of Holy Communion, we invite everyone to come forward. Your child is welcome to receive the body and blood of Christ or they can receive a blessing from the pastors. We believe children learn how to worship by being in church. That said, we also know sometimes kids just aren’t in a worshiping mood. We have a professionally staffed nursery for children ages five and under. The nursery includes a child size bathroom. Many parents of young children choose to have their child participate in the first part of the service up through the children’s sermon, go to the nursery during the scripture readings, sermon and prayers then come back at the time of the offering to participate in Holy Communion and the end of the service. If you have a little one, changing stations are also available in the nursery and both hallway bathrooms. There is a rocking chair located outside the main sanctuary doors, plus ceiling speakers so you can still hear the service if you need to step out. During the worship service before the distribution of Holy Communion, you'll hear the pastor say, "This is the Lord's Table and all are welcome here." We mean what we say! We believe that everyone is welcome to receive Holy Communion. It doesn't matter if you are Lutheran or not, when the last time you went to church happened to be, how old you are, what your background is, if you feel especially close to God or not or even if you are struggling to believe. Holy Communion is God's gift of grace to give us a tangible way to experience God's love and forgiveness. If for whatever reason, though, you would rather not receive Holy Communion, you are still invited to come forward to the altar for a blessing. One of the things that makes a church feel like home is when you get involved and begin to meet more people. There are tons of ways to get involved at Abiding Presence and we would welcome you to take part in any of them. You can read about specific ways to get involved in the Connect, Learn, and Serve areas in the menu at the top of this page. New people are welcome at all of our activities; you don't have to have been here for years to join a small group, fun event, choir, or service project. If you want to talk more about how you can get connected in the congregation, just ask one of our pastors or staff team. I want to make it official. How do I become a member? We welcome anyone and everyone, regardless of race, gender, sexual orientation, age, or ethnic background become a member of Abiding Presence. New member classes are offered quarterly. Just check with Pastor Keseley to find out when the next gathering will be. Joining the church means affirming your faith in God and committing to live out your faith at this point in your life in this congregation.